Well, it doesn't feel like Christmas in Indiana with this heat wave we are having, but Christmas will be here in just about 5 months. 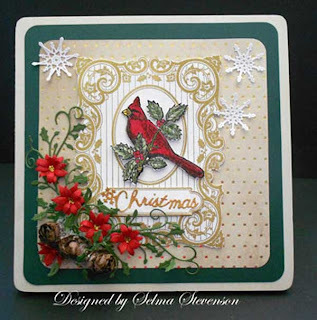 Selma, and I thought that we would help you get an early start to making your Christmas cards with some of our challenges. So, for this week's challenge Selma has created this gorgeous cardinal Christmas card using JustRite's newest stamp. I love this and I am sure you do too. You can read all about it by clicking here! You will have until next Thursday, July 25 morning 6:00 AM EST to link your project. A winner will be chosen from a random drawing for week #29 the winner of the challenge will be announced Friday, July 26. This week's winner will receive a Art Impression Stamp. The winner will also be entered in the 2013 end of the year $100 gift certificate drawing. 3. Or if you are posting to the SCS gallery, you will need to use a special code to tag your card to the challenge. This week's code is joansgardens, JG0718 and needs to be posted with the challenge. Please enter both on the same line with a comma between as I have shown.